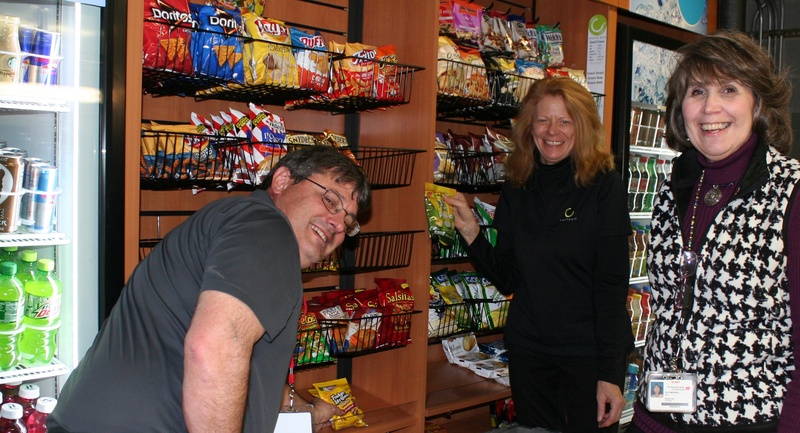 Jane Higinbotham (right), PCA&D Director of Student Life, talks about healthy and yummy food choices with representatives from Avenue C as they the shelves of PCA&D's new micro-market. New this semester at PCA&D! Art students can fuel their work in a new way beginning this semester, with the installation of Avenue C, a state-of-the-art micro-market offering hundreds of snack, beverage and fresh food products located on the third floor. 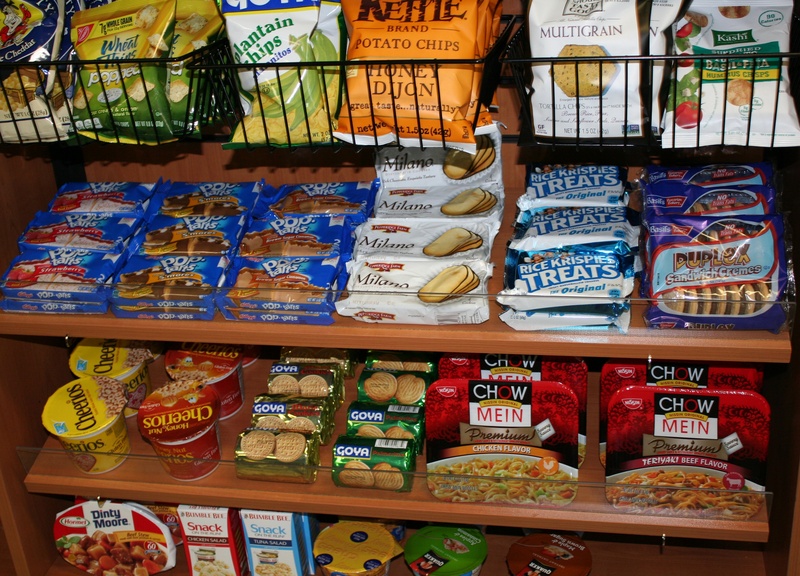 Avenue C allows for selections not often found in traditional vending, such as fresh whole fruit, parfaits, milk, string cheese and hummus. Beverage options reflect the changing habits of today’s consumers with an increased selection of juices, energy drinks and new age beverages. There are even options for fresh-brewed coffee, including some favorite premium brands. Avenue C helps support health dining with a variety of better-for-you product offerings that provide hungry students a wide array of healthful and nutritious food and beverage options. No need to struggle for loose change! All PCA&D students, faculty and staff can set up an account at the Avenue C mini-market. The system is powered with cashier-less technology, ensuring convenient, secure transactions. A kiosk identifies products by barcode, as well as select non-barcoded items, through icons on the kiosk screen, allowing any item in the store to be paid for through self-checkout. 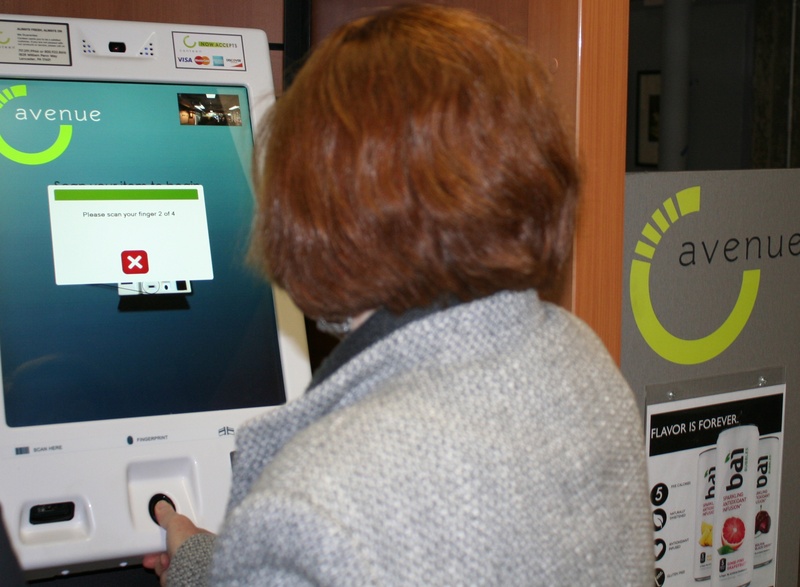 The Avenue C kiosk accepts multiple forms of payment, and transactions take just seconds to complete. Avenue C is a creation of Canteen, Inc., the country's largest and only national vending services company. Avenue C is an additional new dining option at the college this school year, in addition to the availability of food trucks in PCA&D’s Art Garden on Tuesdays and Thursdays, which started in September.